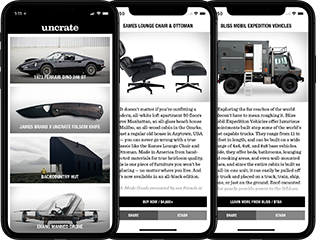 The Uncrate Supply Black Card serves as a digital method to provide yourself or others with a secure form of stored funds that can be applied to any purchases on Uncrate Supply. Purchasers will be emailed with a secure link containing a randomized code to be used during checkout. Purchasers receive this email within 1-hour of purchase. Funds on Uncrate Supply Black Cards do not expire. In other words, it's a gift card. Custom amounts available upon request.